How you have to finish the hat. While you finish the hat. Back to this one from that. It’s the only way to see. 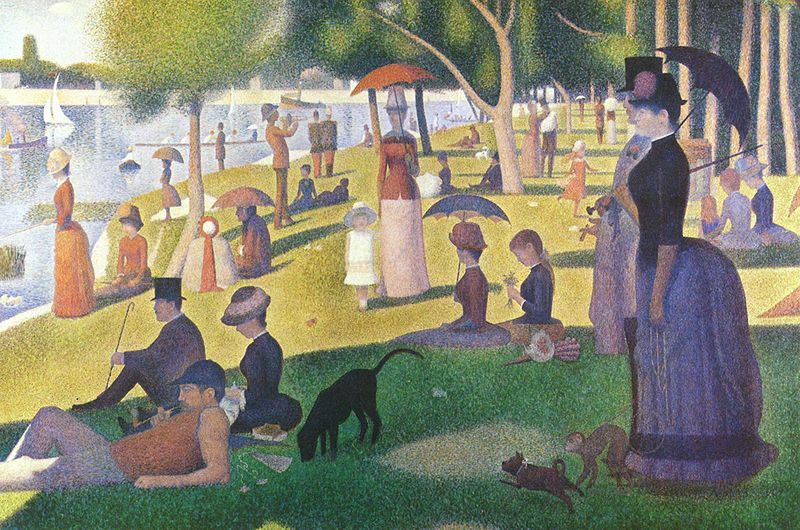 Years ago, a guy I was sweet on and pestering with endless e-mails sent me these lines; they’re the lyrics of the song Finishing The Hat, from Stephen Sondheim’s Sunday In The Park With George, a fanciful musical about the pointillist painter George Seurat. What my object of desire was trying to tell me, I think, was to stop distracting him so that he could get on with his work and “finish the hat”. And it’s all hats, man…little things in the paintings: fingernails, the spine of a book, a teacup, a plum-colored shadow on the inside of a girl’s thigh…no big, grand gestures, no arm’s sweep of vivid color, but a million little details that may not seem important, and yet my paintings are made up of those details, and there is no moving forward until everything has been given it’s share of time, work, and concentration. I don’t think I’ll be blogging very often, or about anything very interesting, until the show’s out of the way. Bear with me. “the hat” is the metaphor, a product for generic people with unique generic hats all. Will miss your posts till you get through with the show. Much admire your disciplne.